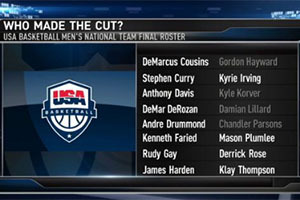 It was always going to be difficult for Team USA to narrow down their roster to just 12 players for the FIBA Basketball World Cup. There have been a number of call-offs that have made the process more difficult (or easier if you were struggling to see who to cut) and as you would expect, there has already been a lot of discussion and debate about the 12 man roster that will be carrying the hopes of the American nation in Spain. This 12 man squad is still the bookmakers favourites for the 2014 FIBA World Cup, and it is still possible to place a bet on the futures market. The individual games market will be opening up shortly, so there will be a strong array of basketball betting options for people looking to make a wager or two on this upcoming sporting event. When Rose was absent from the American friendly win against the Dominican Republic, there were concerns that the player’s injury problems would come back to haunt him at the worst possible time. The last two years have been fairly rotten for Rose with respect to injuries, which mean that most basketball fans will be delighted at seeing the player with the chance to strut his stuff on the big stage. There will be some Chicago Bulls fans that would prefer Rose to be staying at home this summer, resting up for the new NBA season but most neutrals will be delighted to see him in action for America in Spain. While the news that Derrick Rose was handed a slot in the 12 man roster was well received, there was obviously some remarks and grumbles about the players that missed out on the roster. The final four players who were removed from the roster were Chandler Parsons, Gordon Hayward, Kyle Korver and Damian Lillard. While some of these omissions were expected, the news of Lillard being removed from the squad caused a great deal of angst on twitter. You can rely on social media to allow a platform for people’s gripes and it seemed that fans of the player wasted no time in informing the world why this was such a bad decision for Team USA. There was always going to be one or two players left out that people were strongly rooting for, which means that there was always going to be some fans who felt really angry about the final squad. Team USA play their first match of the 2014 FIBA World Cup in Spain against Finland on the 30th of August. Even after some high profile drop-outs the American side remain the favourites with bookmakers, and the team will be going all out for victory. The glory of picking up a gold medal is a major incentive for sportsmen but there is also the knowledge that the FIBA winners receive a spot at the 2016 Olympics, being held in Rio de Janeiro. This is the major platform that basketball players want to play on, so the incentive in Spain may be to book an Olympic spot, as opposed to winning the FIBA World Cup itself.